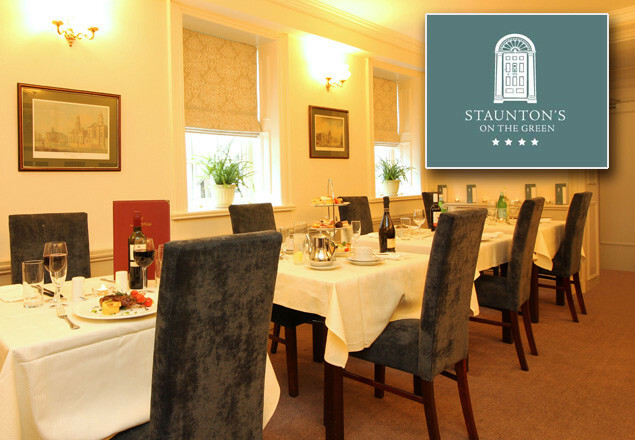 Enjoy a 3 course dinner with a complimentary bottle of house wine for two people in Stauntons Restaurant, for only €62. Located in Stauntons On The Green, at 83 St. Stephens Green South. Dublin 2. Elegantly simple menu, freshly cooked every day using locally sourced ingredients, to be enjoyed in relaxing surroundings. Served Tuesday to Saturday inclusive from 5pm to 9pm. Vouchers are valid 5 days a week. Tuesday-Saturday from 5pm-9pm. Vouchers can be used from January 25h​ to April 16th 2016. Vouchers are valid for dinner bookings only and from 5pm Tuesday-Saturday . After you have purchased your voucher please email ann@stauntonsonthegreen.ie ​ to book your table. Your full name, date, number of guests, time, phone number and voucher code is required in order to secure a reservation. Please note - your voucher must be used by April 16th 2016. This redemption date is firm. No correspondence will be entered into regarding late redemption of your voucher. No refunds can be given after this date. A hard copy of voucher must be presented upon arrival at restaurant.